When you stay at Thon Hotel Jølster in Skei, you'll be on a lake and 9 minutes by car from Jostedalsbreen National Park. Featured amenities include a 24-hour front desk, a safe deposit box at the front desk, and an elevator (lift). This hotel has 16 meeting rooms available for events. Free self parking is available onsite. 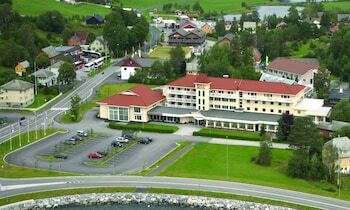 When you stay at Tørvis Hotell in Luster, you'll be on the waterfront and 9 minutes by car from Hafslo Ski Centre. Free self parking is available onsite.